I read this poem at the Sophisticated Boom Boom last week. If you’re interested in reading a copy of the poetry zine we published last month, you can do so here. Last Sunday marked the victorious return of the Starving Artist Soup Kitchen. I’ve been doing these dinner parties on and off over the past year, and I was very excited to continue the evening into 2015. 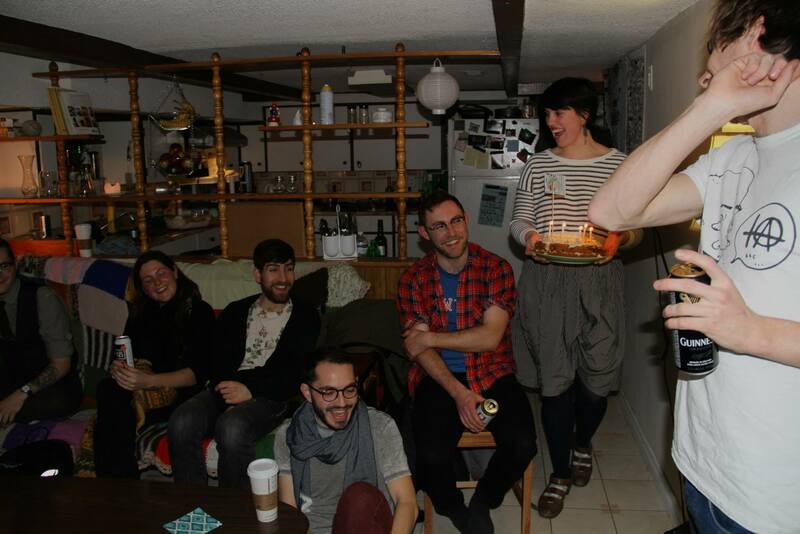 We gathered in my basement living room here, in Toronto, Ontario. I made a slow-cooker beef stew and my favorite apple crumble. 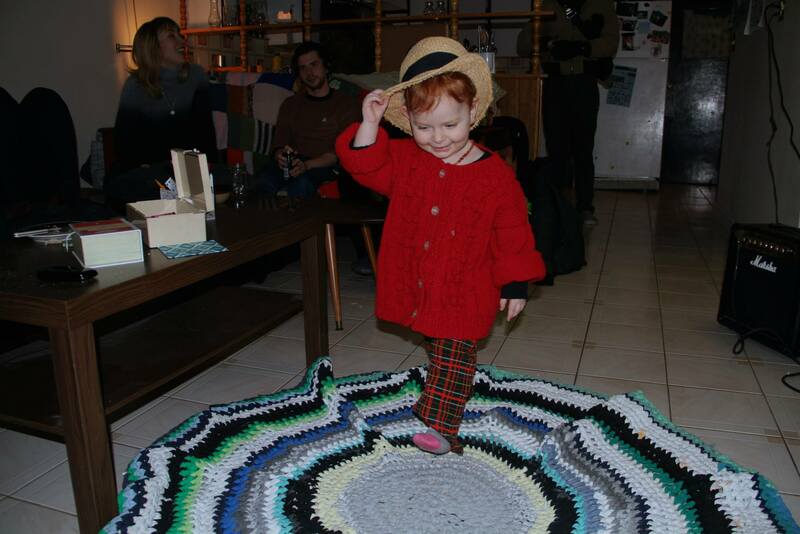 The party consisted of over twenty people, including my adorable god-daughter. My dear friend Nick McKinlay shared with us some of his songs – old & new. 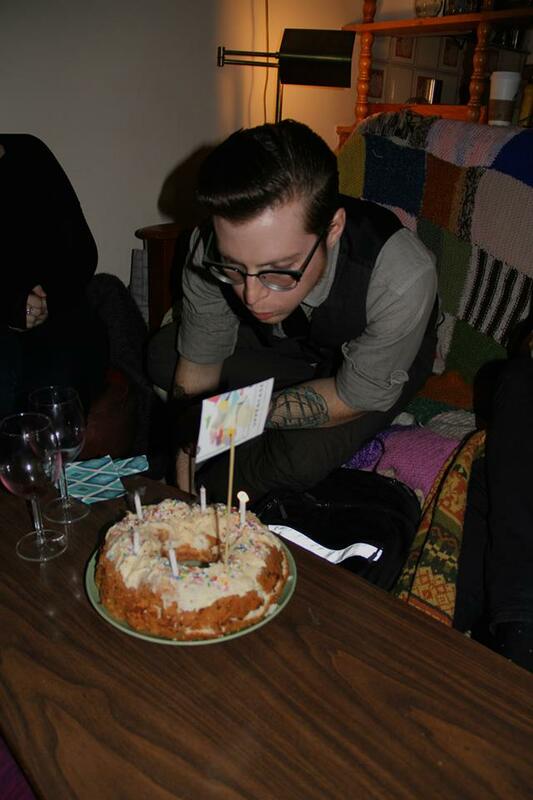 It was also Corey’s birthday, so he got a cake! Overall, a magical evening. 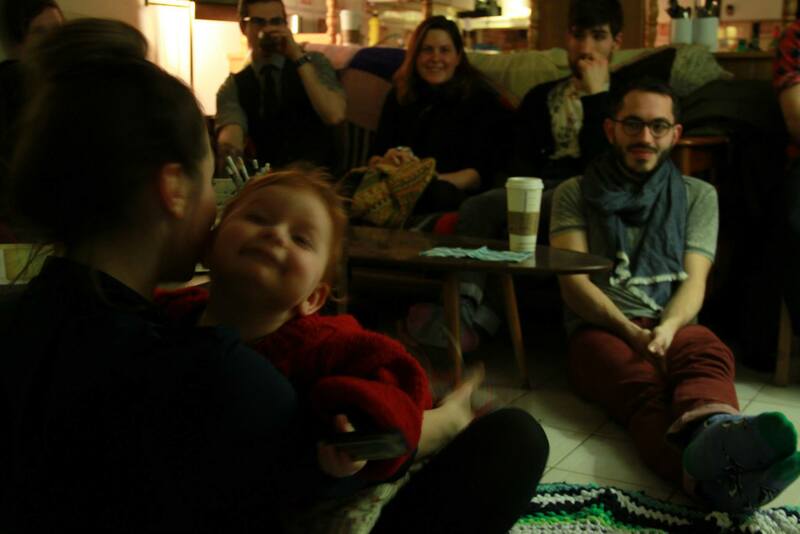 I feel lucky to be able to build up such a sharing community in this cold, dark city of ours. The night did take a lot out of me (including an entire Sunday) but I’m slowly pulling myself back together. All of the images within this post were taken by Rebeccah Love & used with permission. So, I do what any want-to-be-50’s-housewife does when cold + flu season hits. I make soup. Lots of it. Using my slow cooker, of course! Drizzle olive oil on the bottom of your slow cooker. Fill the slow cooker with the diced carrots, celery, onion & garlic. Place the meat on top of the vegetables and sprinkle with salt, pepper, parsley flakes and bay leaves. Cover with soup stock and place on high for 5-6 hours. After cooking, remove chicken and bay leaves from slow cooker. Add pasta to the soup. Rid yourself of the bay leaves. Shred the chicken. After about twenty minutes the pasta will be done cooking, add the shredded chicken back to the slow cooker. Serve when it’s cooled, or else you might burn your tongue! It’s hearty and nourishing but, makes an incredible amount of food. When I’m cooking I turn into a homesteader from the 1800s with eleven mouths to feed. If you make this soup, be prepared to be feeding the neighborhood for a week and, be sure to let me know how it turns out. I’m going to go rest up, have a great weekend! 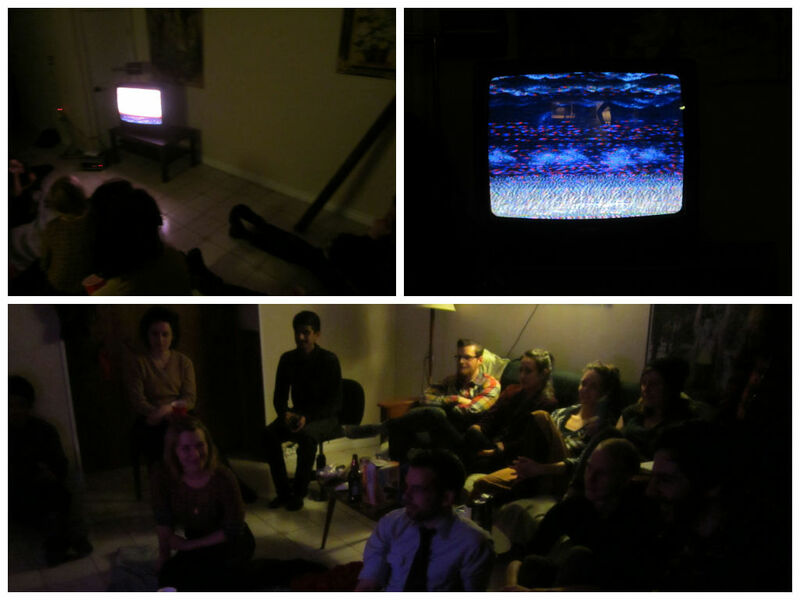 Last Sunday, I hosted the Starving Artist’s Soup Kitchen: March & Peter Rahul of the Analog Preservation Network shared with us Hyperlink 1.0, a sort-of digital zine distributed on VHS. I didn’t actually meet Peter until Sunday night, (he was a friend-of-a-friend, although now we’re friends) but he is totally rad and did an awesome job introducing each tidbit of the viewing. 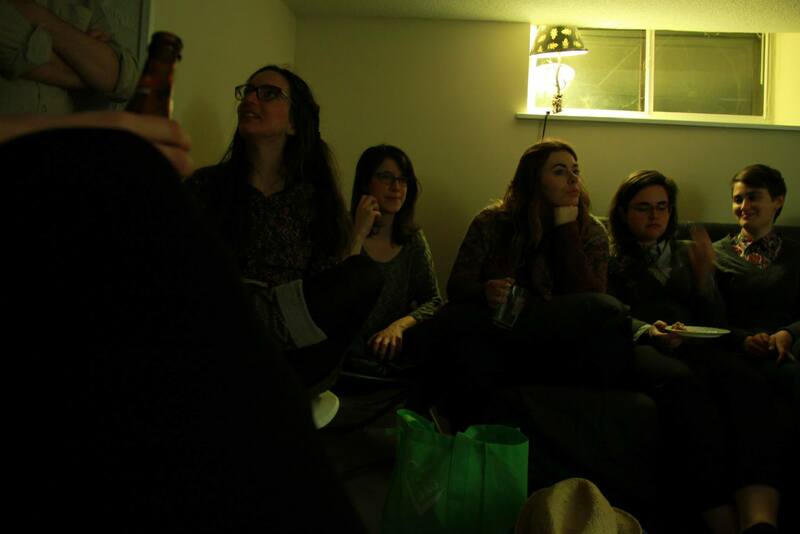 This SASK was the smoothest yet, with around 17 attendees not including roommates. Woo! 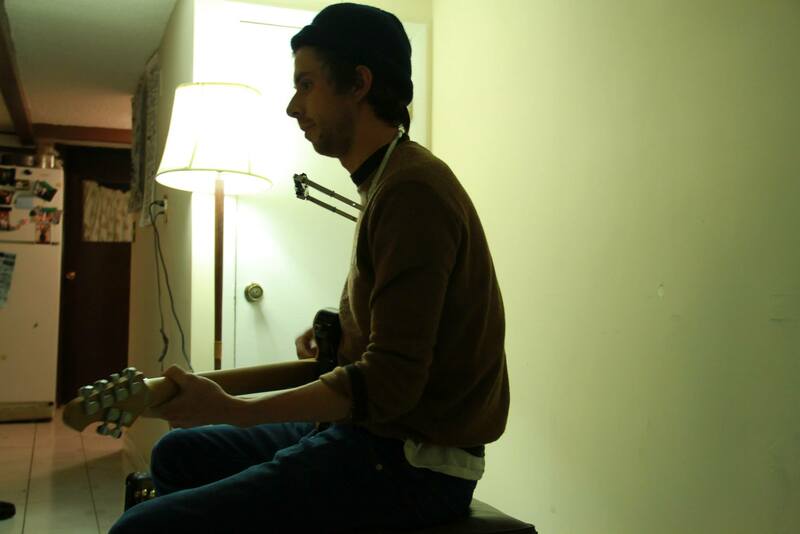 The Starving Artist’s Soup Kitchen takes place at the end of every month in my basement in Toronto, Ontario. The goal of event is to gather community and provide a platform for emerging artists to share their work. Plus, I make soup. Mmmm. The soup I served this time around was Roasted Red Pepper with a dash of sour cream. The crowd really seemed to dig it, so maybe you will too! Chop the potatoes, celery and onion and place in a large soup pot with the olive oil covering the bottom of the pot. Place on medium-high until the taters soften, stirring occasionally. Season with salt and pepper. Toss in red peppers, tomatoes, vegetable broth and 2 cups of water. Bring to a simmer, then uncover and cook for about twenty minutes. After letting the soup chill out for a bit, use your roommate’s awesome immersion blender to smooth out into a edible slosh. Serve with a dollop of sour cream, and crusty bread. Two Sundays ago I was lucky enough to have a reasonable turnout for the 2nd Starving Artists Soup Kitchen (SASK). All the new faces were able to delight in a few songs from Alana Leprich’s acoustic guitar, and enjoy the all-time award winning combination of tomato soup & grilled cheese. 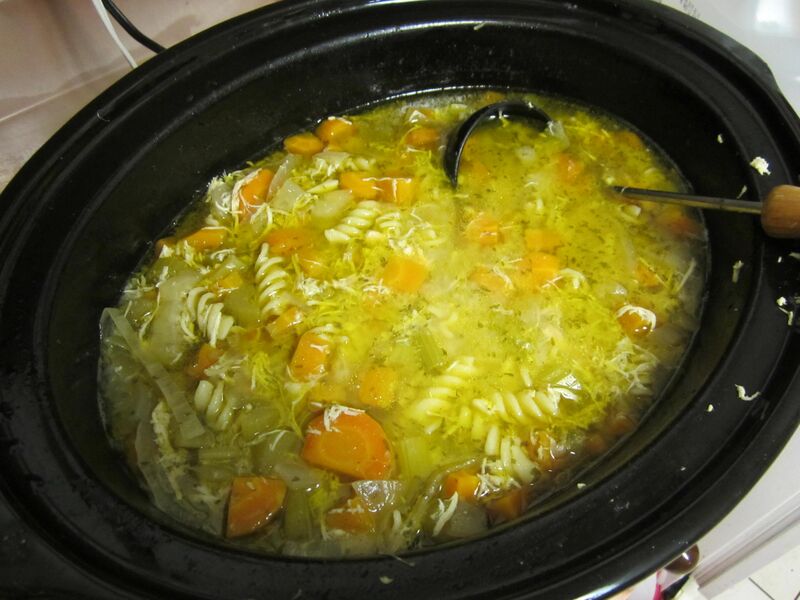 Like last time, I made a large pot of soup in my slow cooker, unlike last time the soup turned out really tasty and I fully encourage you to try this recipe! Step 1) Cover the bottom of your slow cooker (my is six quarts) with olive oil and throw in the carrots, onions and garlic. Stir them with a spoon and sprinkle with salt. Step 2) Add the tomatoes and the vegetable broth, stir again. Step 3) Stir in the beautiful smelling basil and leave to cook for 4 – 6 hours. Step 4) When ready/an hour before serving unplug the slow cooker and let it cool. Step 5) Use an immersion blender to smooth out the soup into a delicious hot mess. Step 6) Get a new friend to make grilled cheese sandwiches & enjoy! Let me know if you try this recipe. Otherwise, have a great weekend! On Sunday night I was able to accomplish a long-standing goal of mine: bring people together with food & art. Known officially as The Starving Artists’ Soup Kitchen twenty or so people gathered in my basement, for large pots of vegan soup & carnivore chili, and to watch 16mm films that Emily Waknine put together. It was a radical, community-building time and the next gathering is already in the works. In other news, anyone in London these days should for sure, for sure check out this Hannah Höch exhibit sooner-rather-than-later. Anyone not in London should at least check out the promotional video, its exceptionally inspiring!